Live Oak, Fla. – Nine agriculturists were recognized for their exceptional natural resource conservation with a County Alliance for Responsible Environmental Stewardship (CARES) designation at the 18th annual Suwannee River Partnership recognition dinner on May 3 at the UF/IFAS North Florida Research and Education Center-Suwannee Valley. The event honored farmers and ranchers who have voluntarily implemented science-based and field-tested Best Management Practices (BMPs) that conserve and protect Florida’s natural resources on their properties. The following farmers were recognized for caring for the environment: Matt Bishop of Jefferson County, Larry Sessions and Barry Long of Suwannee County, Glenn Ritch and Jack Tatum of Bradford County, Jeffery Hamrick of Madison County, Svend Dieffenbach of Hamilton County and Jimmy Tallman of Union County. UF/IFAS NFREC-Suwannee Valley received a special recognition for support of the CARES program. After the ceremony, Nutrien in White Springs presented the Farm Bureau with a $10,000 check in support of the CARES program. The CARES program was created by Florida Farm Bureau and the Suwannee River Partnership in 2001 to promote public recognition of outstanding agricultural conservation achievements by farm families. 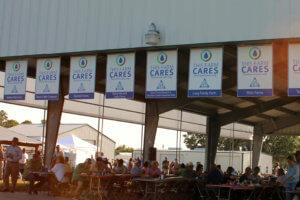 More than 800 agriculturists statewide have received the CARES award.